Available as a standard or a bush rose, the Winchester Cathedral rose is a wonderful white scented rose with fully double flowers. This is a David Austin Rose, early flowering, hardy and with masses of flowers from spring through summer to autumn has the advantage of being fragrant as well. 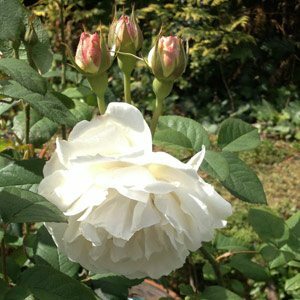 Winchester Cathedral is a rose which is seem as an excellent substitute for the Iceberg rose for those who are looking for fragrance in a prolific flowering white rose. This is an early flowering and long flowering rose, try not to prune later than mid winter as Winchester Cathedral will be ready to flower in early spring given some warm weather. On occasions Winchester Cathedral will throw some pink flowers, this is because it is a ‘sport’ of Mary Rose a pink flowering rose well worth a look.